Roof Damage. 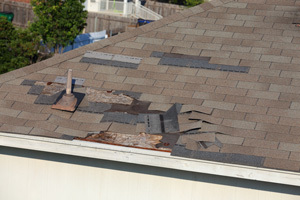 Whether it's one damaged shingle or severe storm damage, it's best to repair your roof right away. There are several reasons for homeowners to consider hiring a roofing contractor for roof repairs. Perhaps your house has a minor leak that you've been ignoring, or a severe storm passed through and damaged some of your roof shingles. Though you may have ignored these problems in the past, it's best to act on them now to avoid more permanent, costly, and detrimental issues down the road. Repairing your roof right away can not only prolong the life of your roof, but it will help it remain aesthetically pleasing and enhance the overall value of your home. Are you in need of roof repairs? Ridgid Construction services Oklahoma City, Norman, Edmond and most areas nearby! Call us today to schedule a free estimate. You want to be able to rely on a roofing contractor you can trust, which is why Ridgid Construction is here to help you. We solve a wide range of roofing issues, from leak repairs, to emergency roof repairs, damaged shingles, or even signs of wood rot and aging. If you live in Yukon, Moore, Mustang, Bethany, El Reno, Choctaw, Newcastle, or any area nearby, contact us today to get started on your roof repairs, and if necessary, roof replacement.